30 | March | 2013 | Papers, Please! March 30, 2013 – Papers, Please! If you can’t make it to the Cato Institute, watch this event live online at www.cato.org/live. The Cato Institute asks that you pre-register if you plan to attend in person, but that’s just so they have an estimate of the expected attendance. 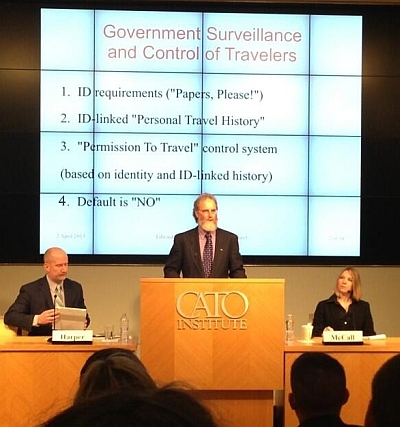 Hasbrouck will be presenting examples of what he found in his files when he sued the DHS for its records of his travels, what other travelers have found in theirs, and how the DHS obtains and uses this information to track us and to control who is allowed to travel. As part of the same program, Ginger McCall of EPIC will be discussing the TSA’s proposed “rules” to require all air travelers to submit to virtual strip-searches. You have 90 days, until 24 June 2013, to tell them what you think of their proposal. (On the form to submit comments to the TSA, note that all of the fields except your comment itself are optional.) You can find some ideas for what to say in our previous article about the rulemaking. There will be a live webcast, for those who aren’t in DC. If you’d like to follow along, you can download the slides from Hasbrouck’s presentation as a PDF file.